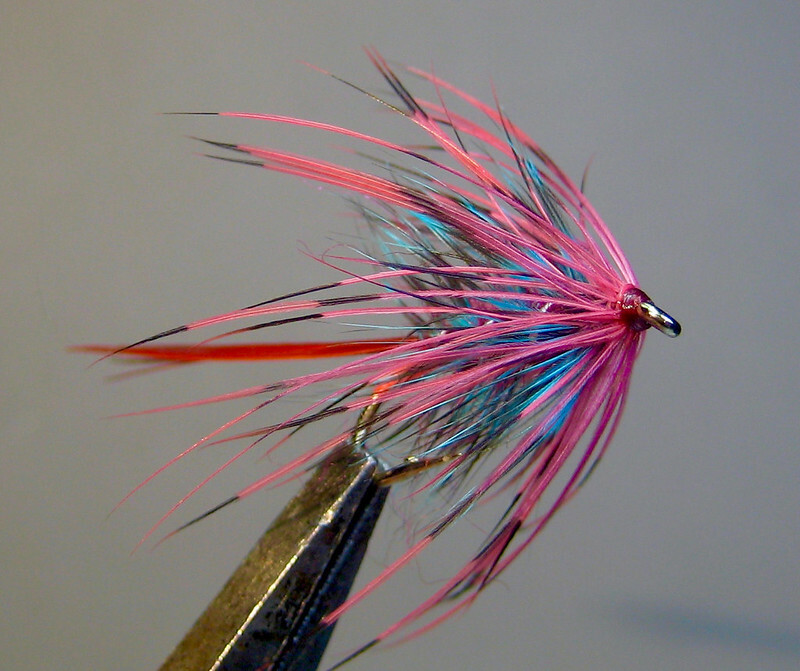 Adventures in dyeing; aiming for magenta but came up a bit short. 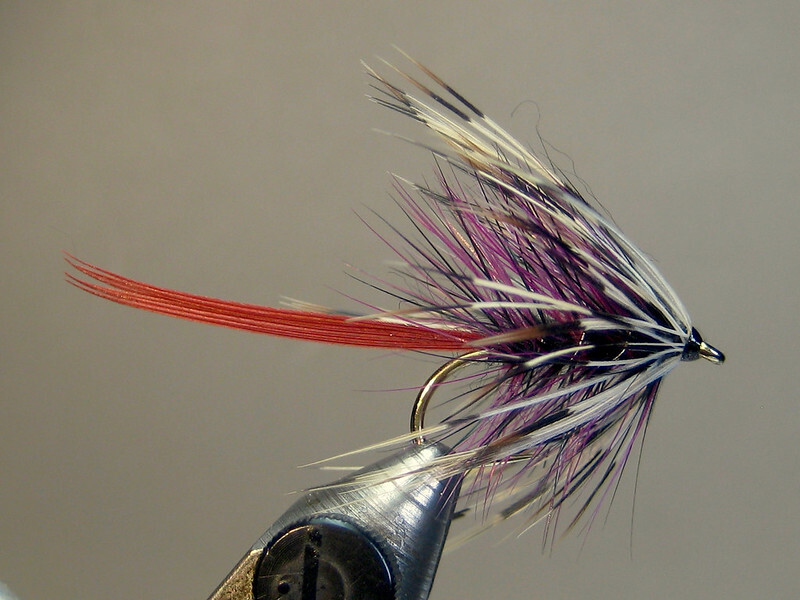 The Rit Fuchsia was very intense; need to work on concentration and time in dye bath and maybe add a bit of violet (or scarlet?). 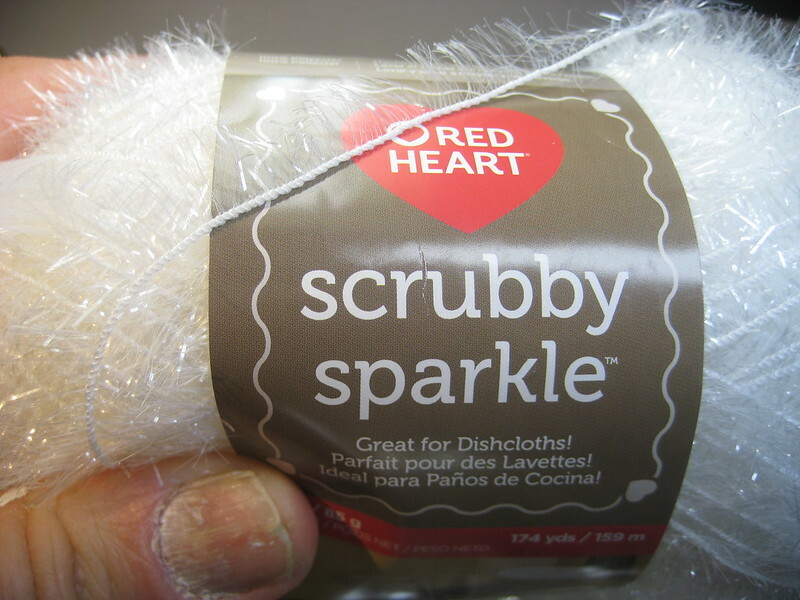 Last edited by ScottP on Wed Feb 13, 2019 6:18 am, edited 2 times in total. 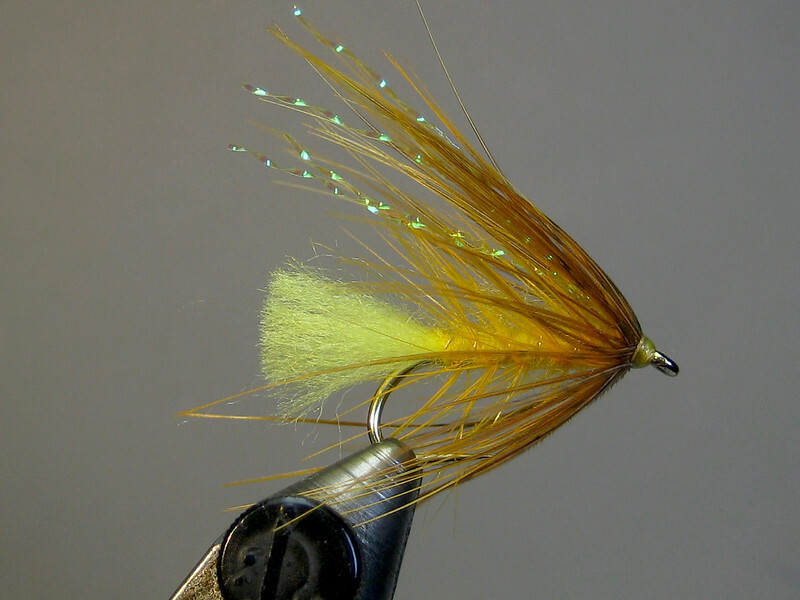 Taking a jaundiced view; the Krystal Flash is optional but adds a nice bit of sparkle. 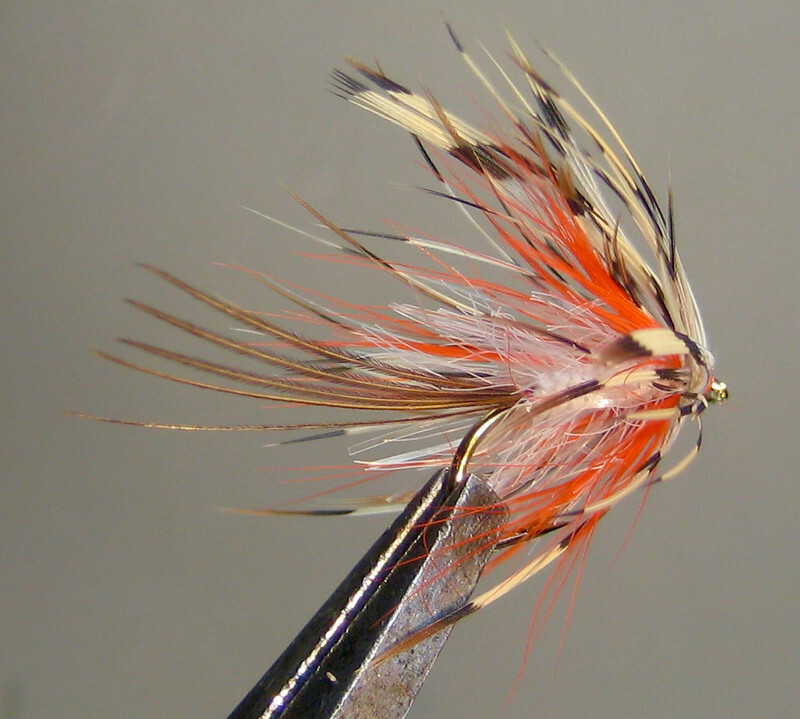 Playing around with dapping flies and found this one on a U.K. forum; kind of an untrimmed Spundun in a perpendicular orientation. 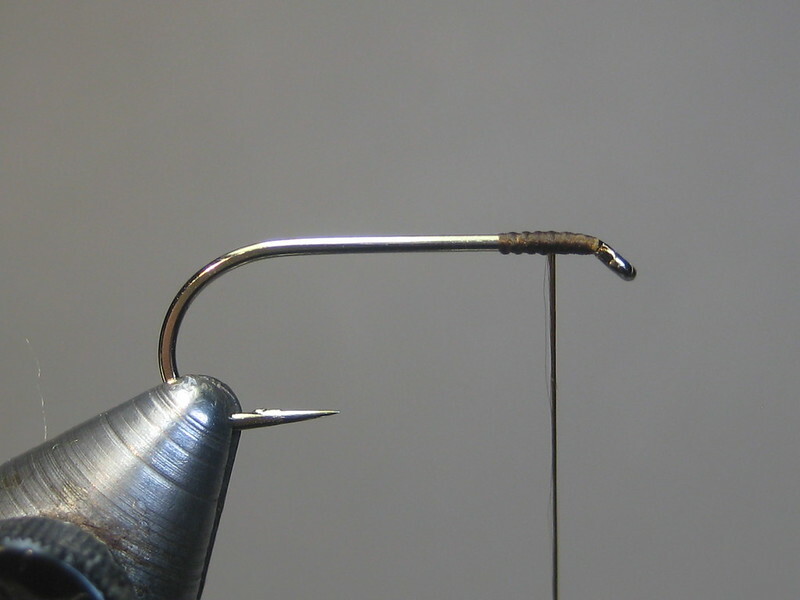 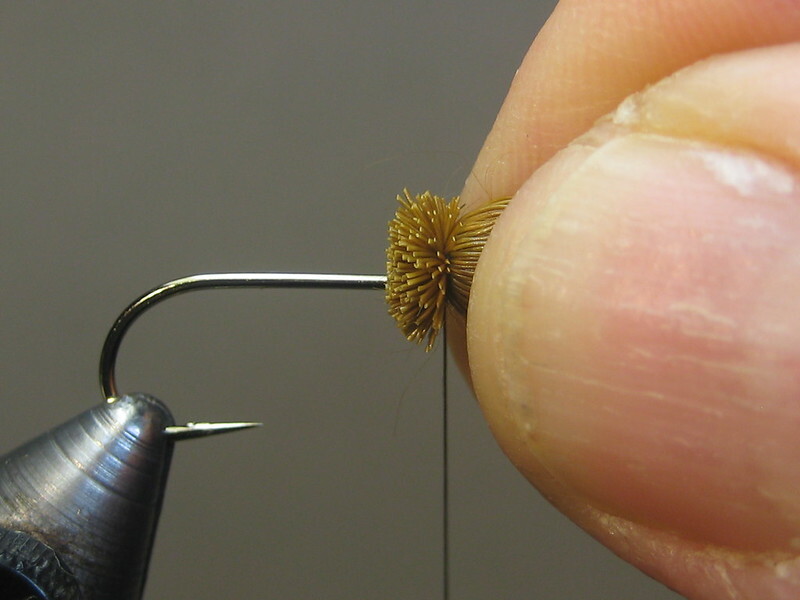 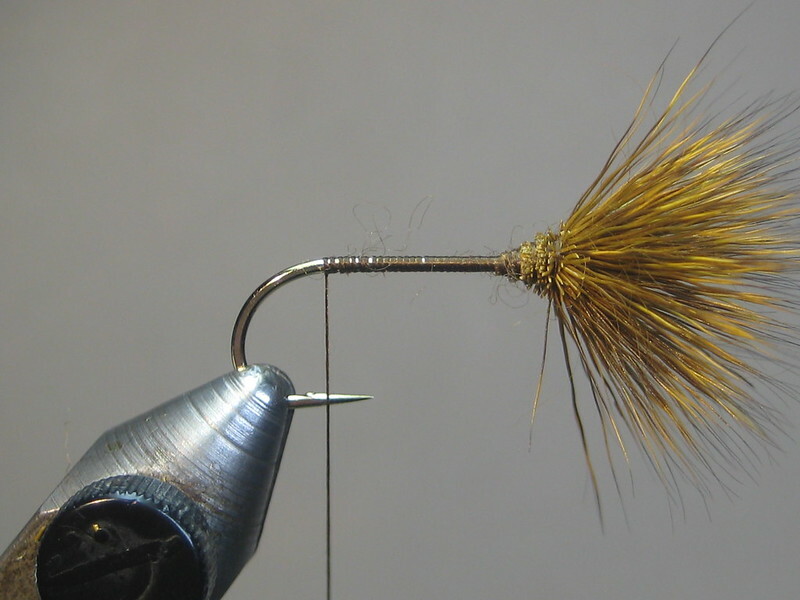 Still looking for the proper WOIGO; added a bit more tan to the Rit Old Gold formula and came up a little too dark but it provided a neat shade that might work here as a western March Brown (not that the fish are going to be that particular about it anyway) in a smaller hook. 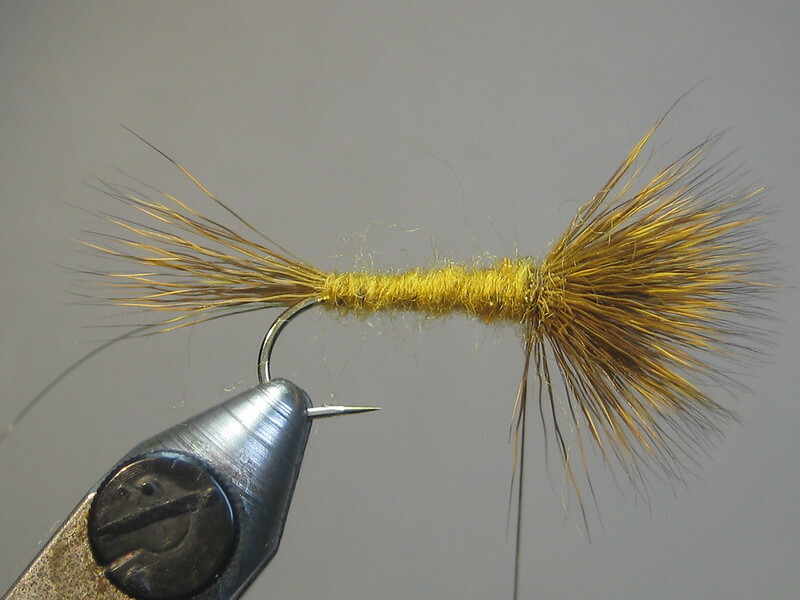 Getting closer to THAT shade; white belly hair used here because the piece of natural that I dyed was still drying. 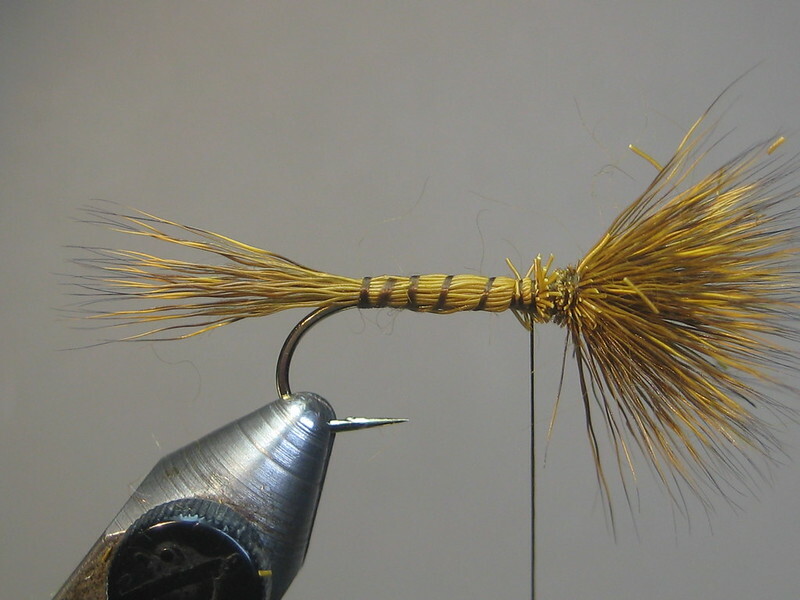 Longer body hackle than the Kate for a shaggier appearance. 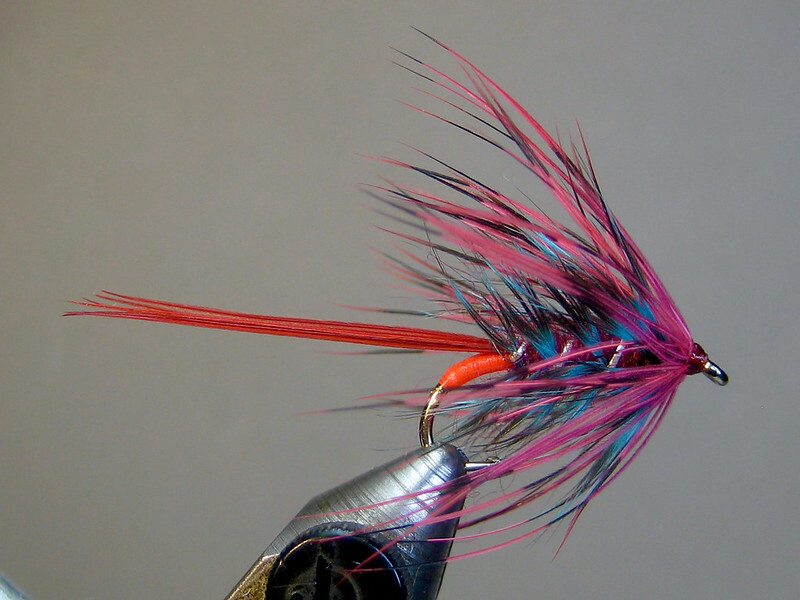 Found this version in an article in Trout & Salmon. 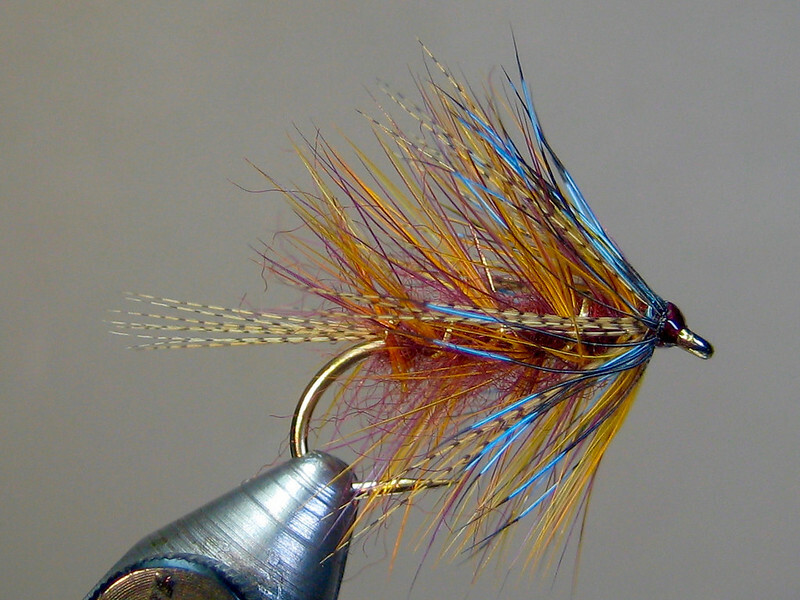 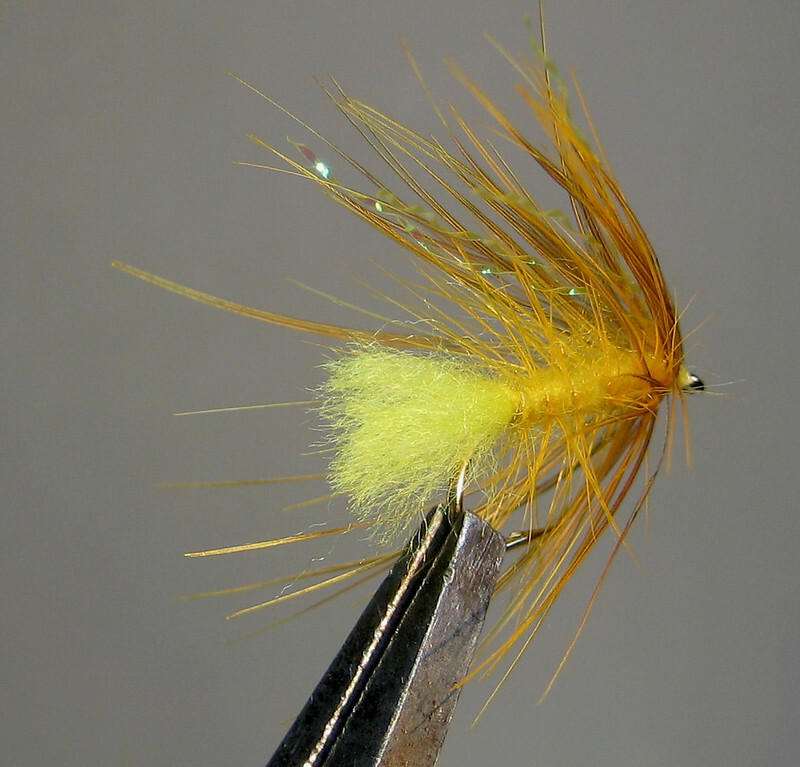 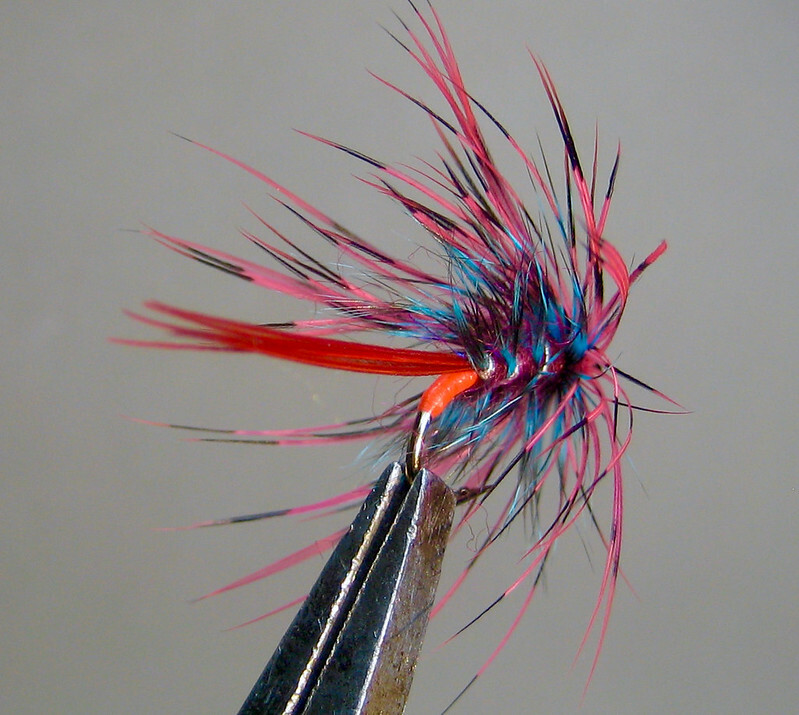 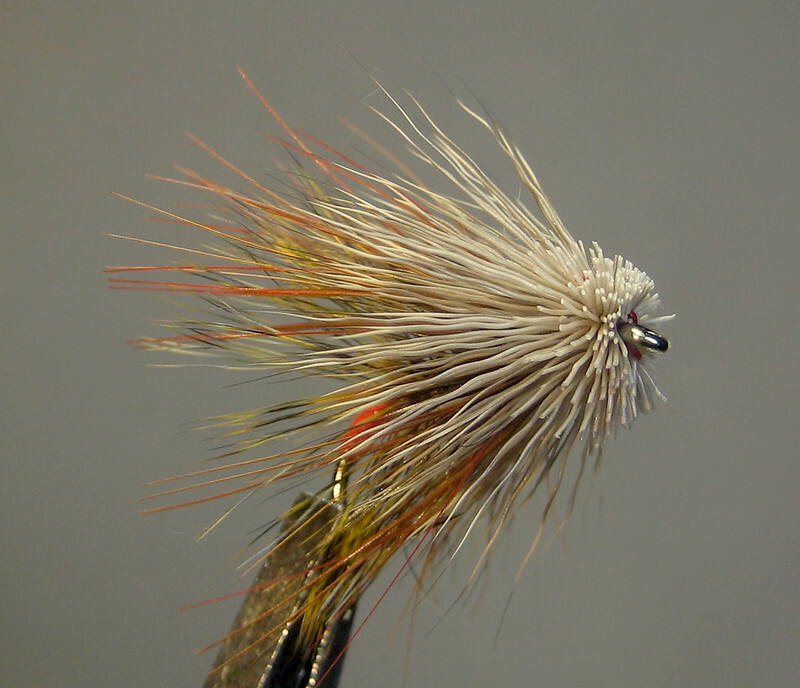 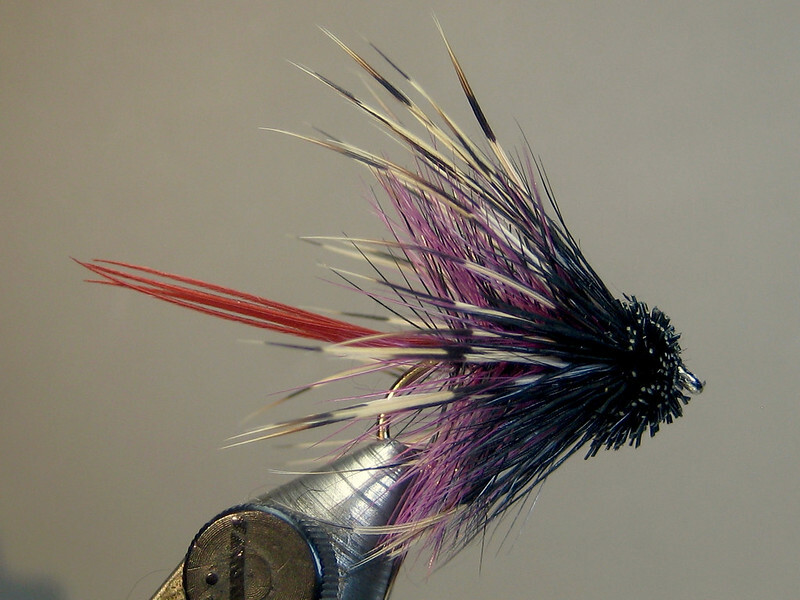 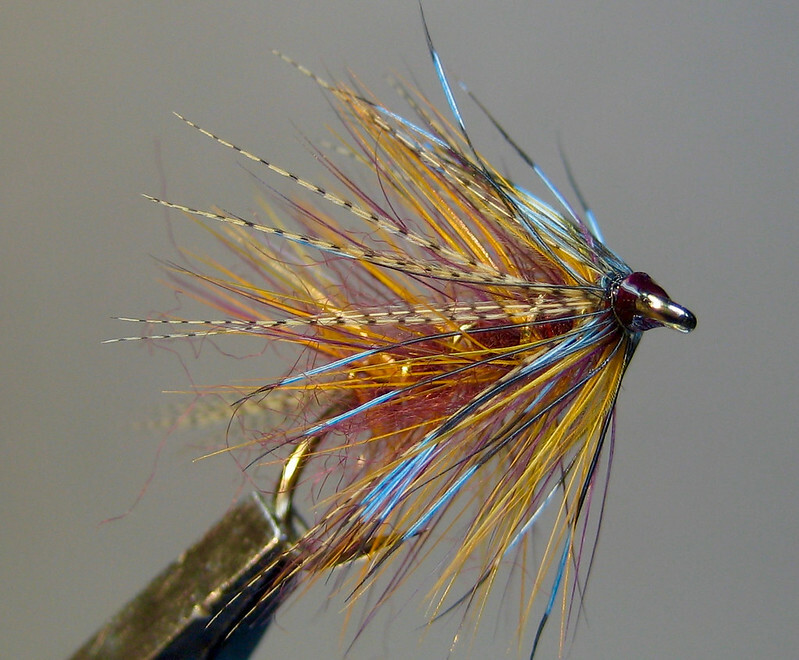 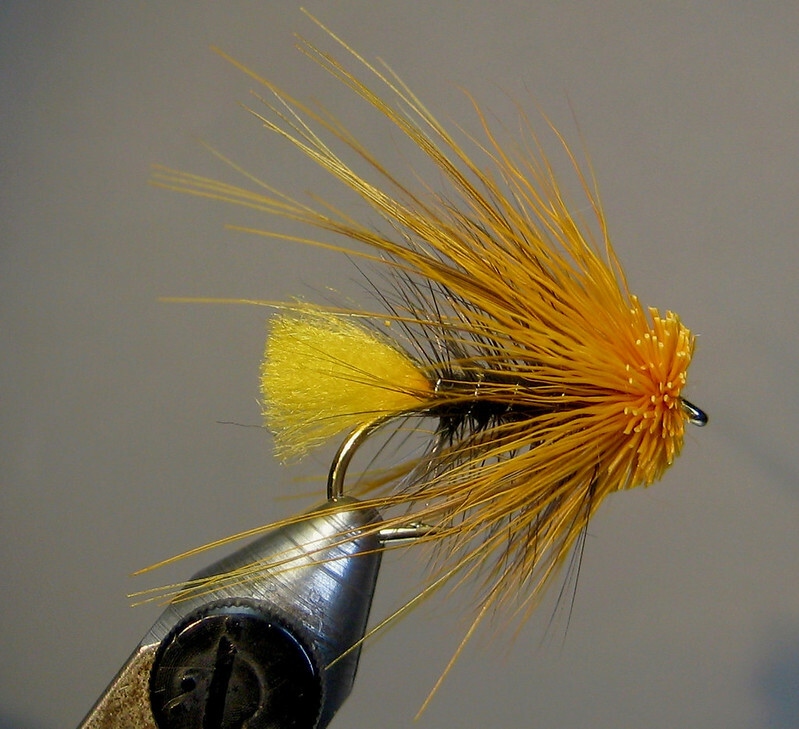 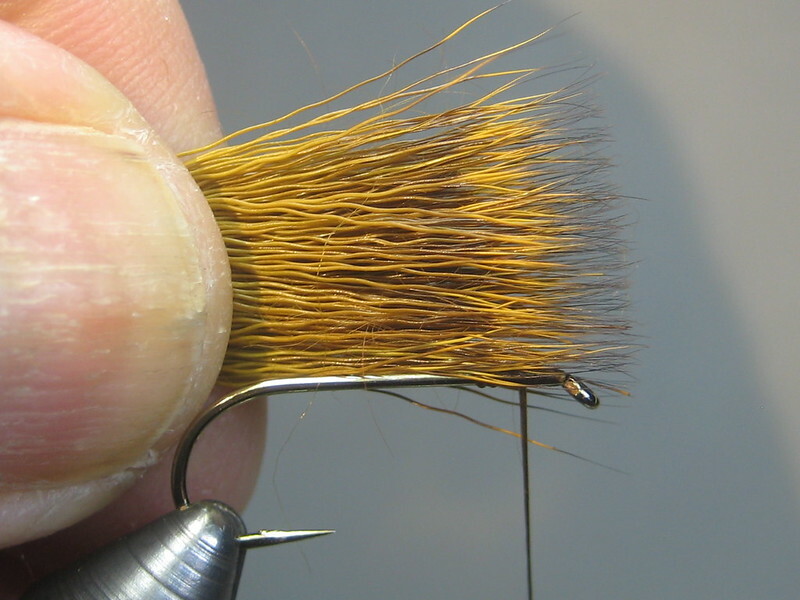 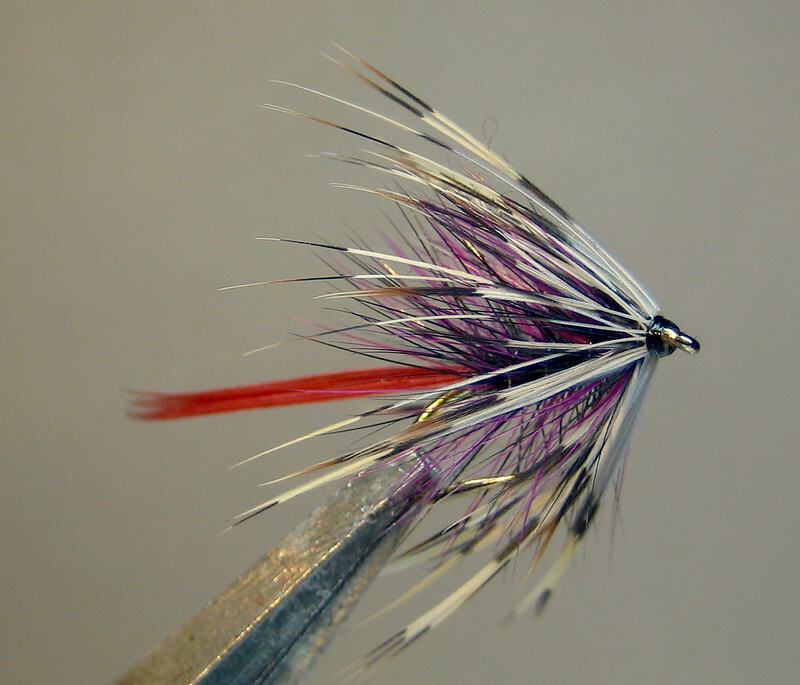 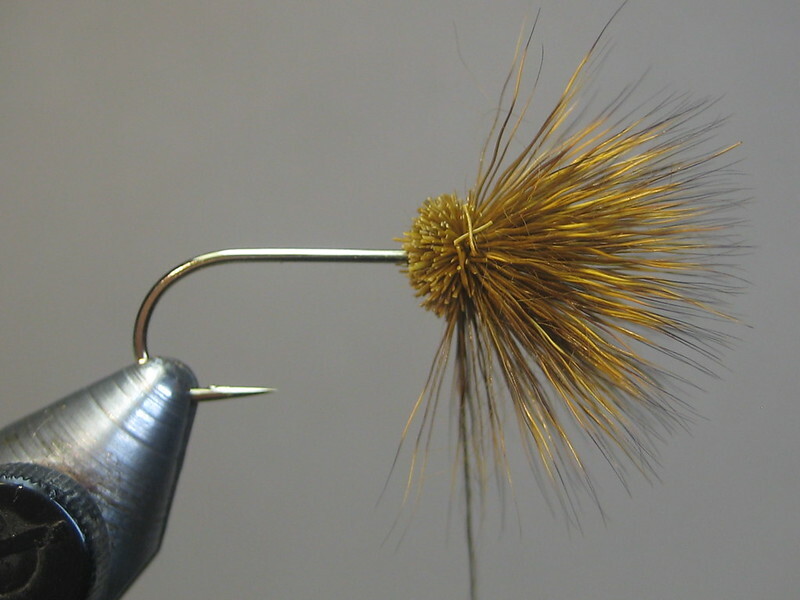 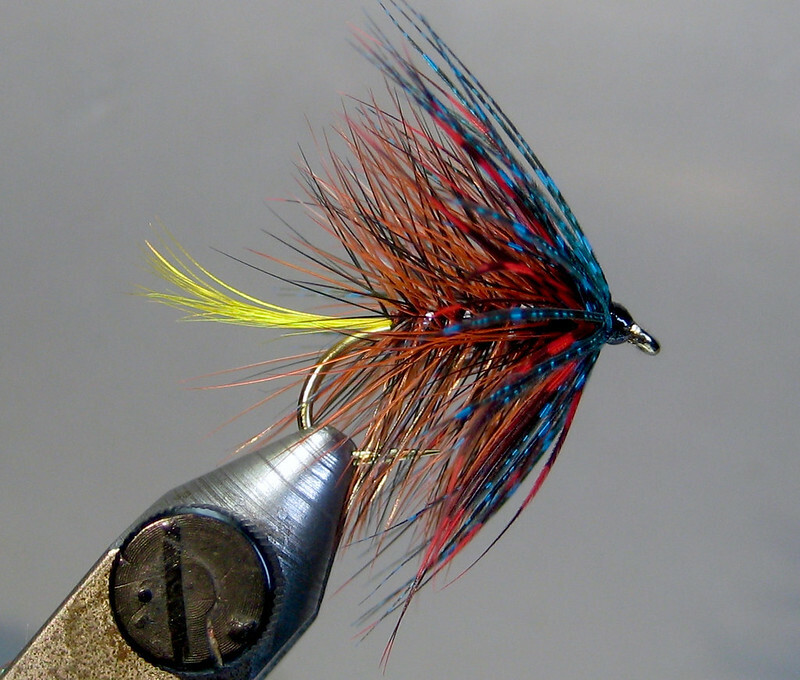 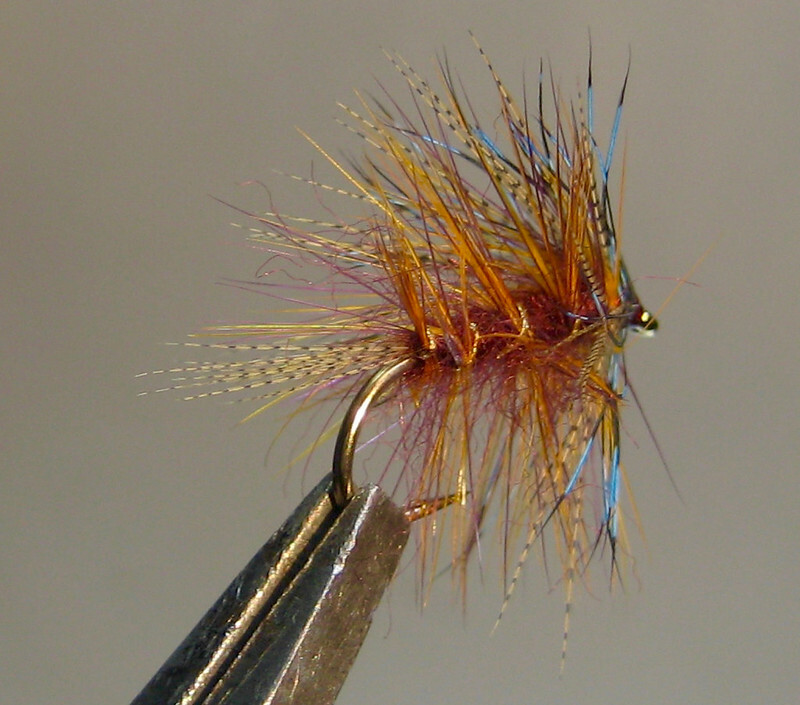 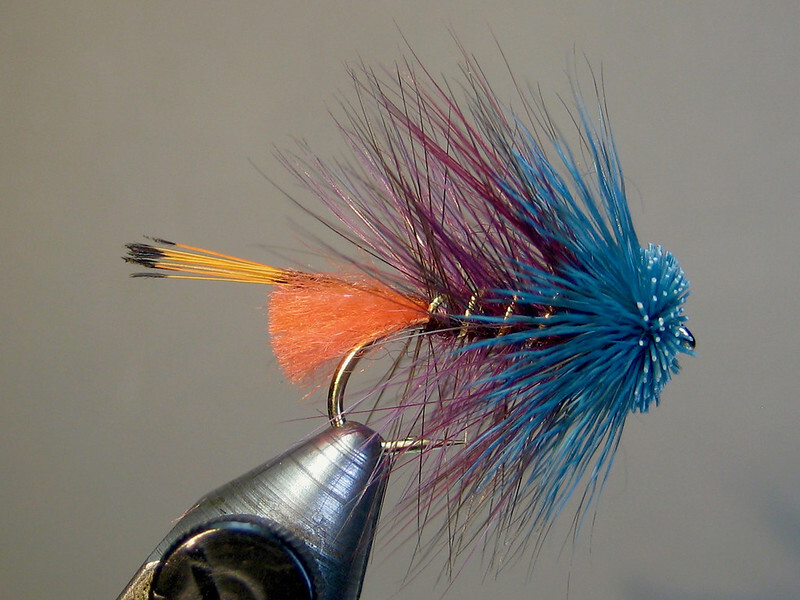 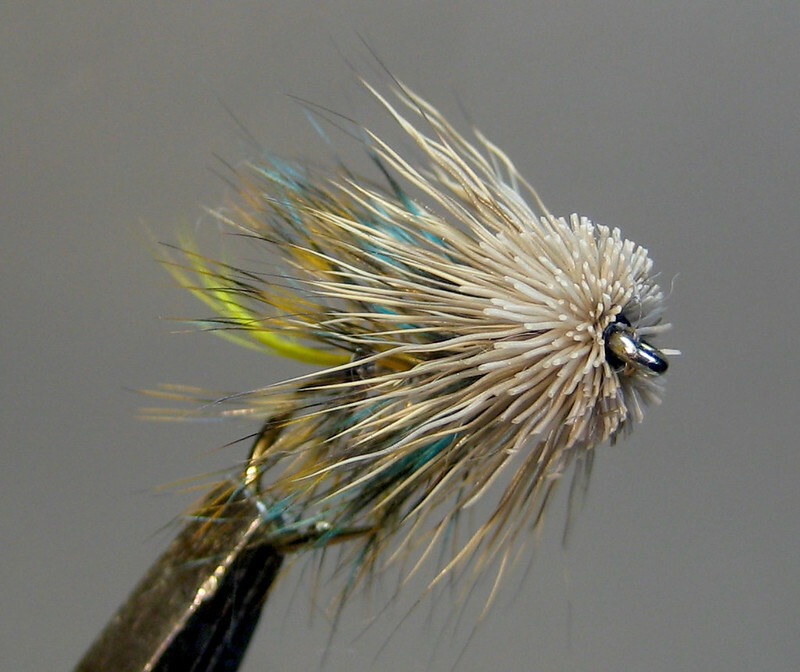 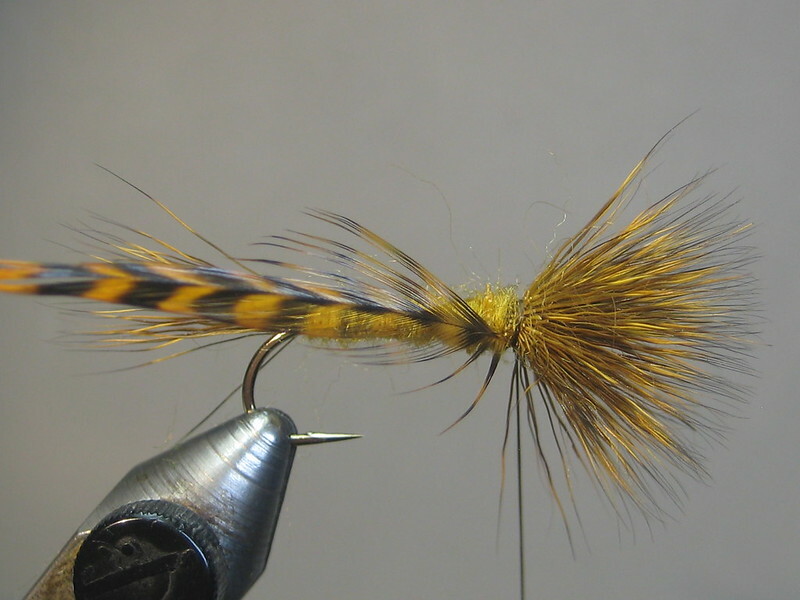 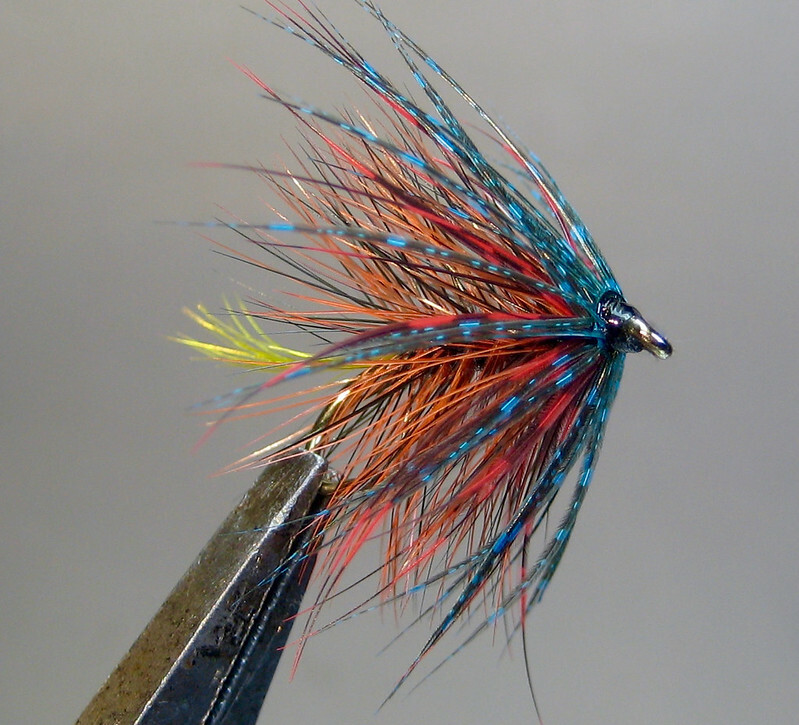 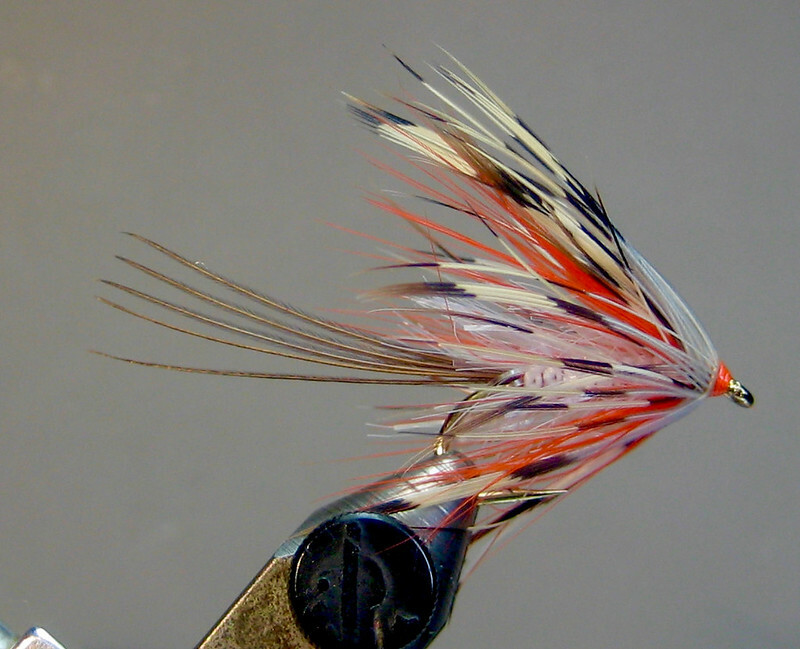 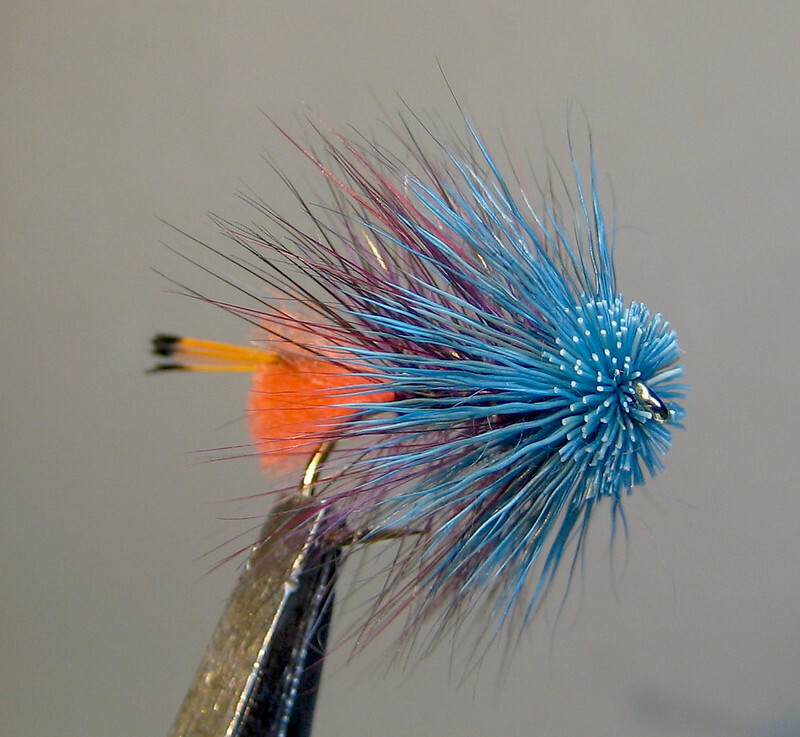 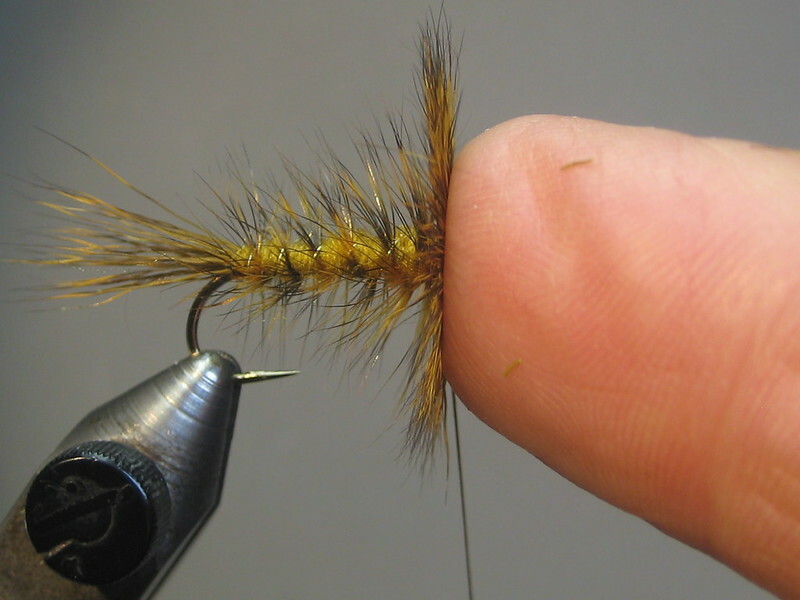 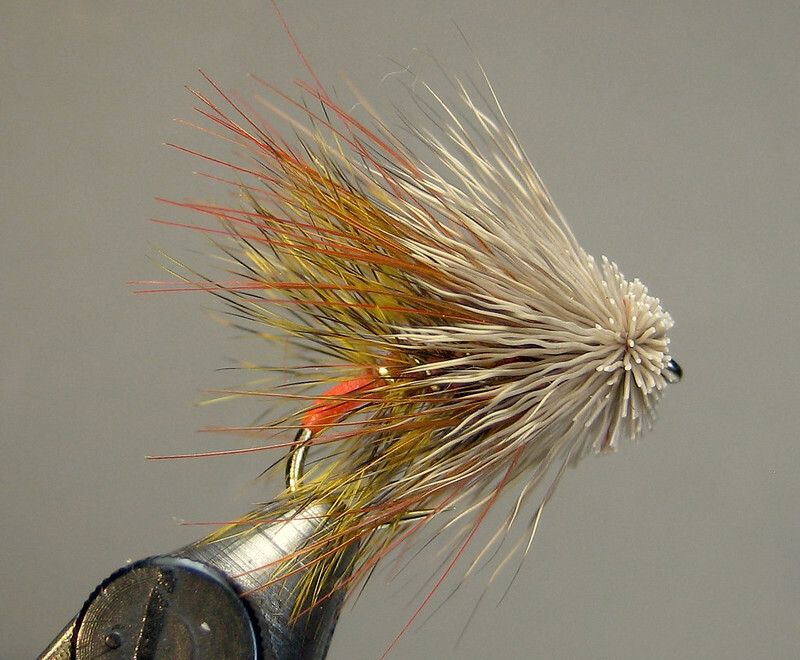 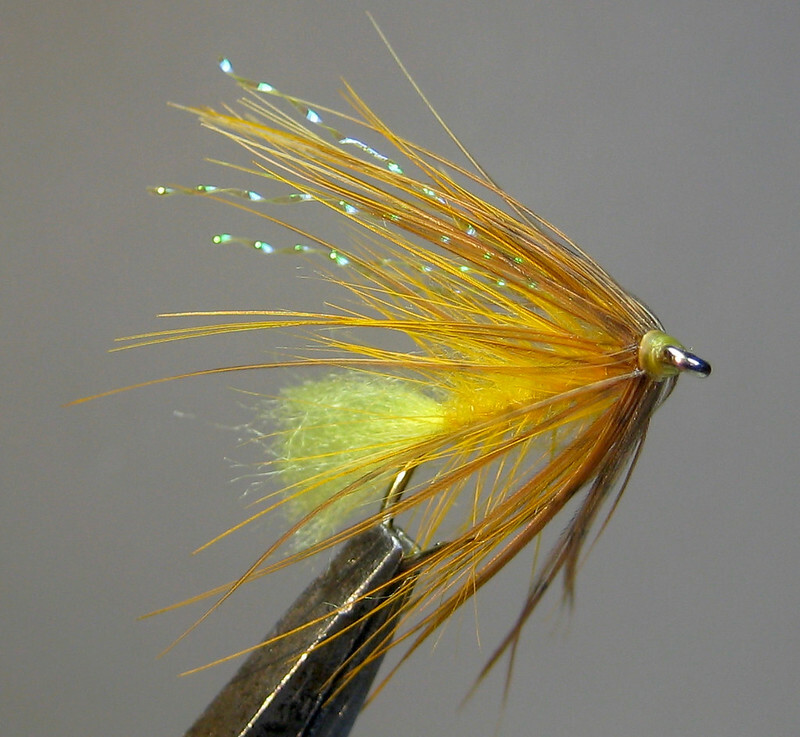 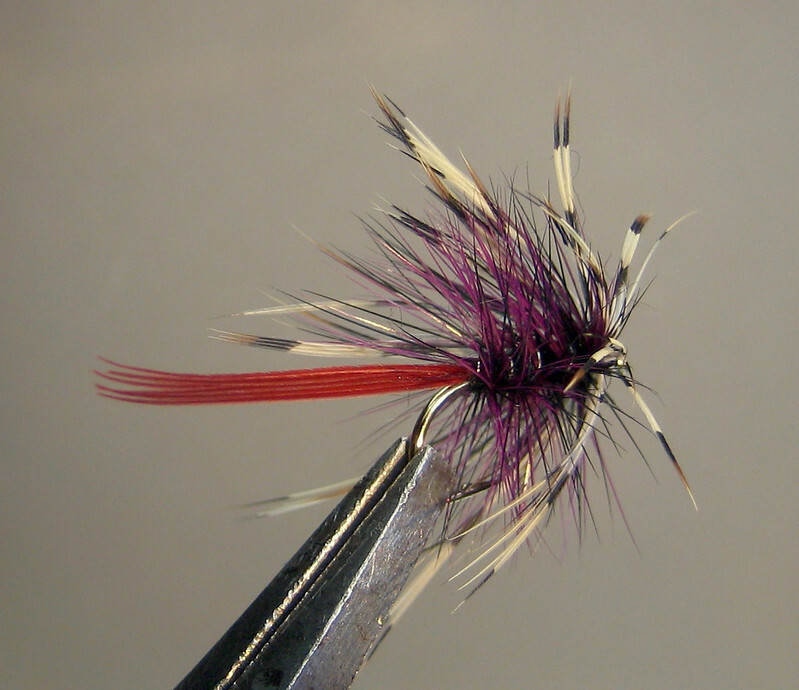 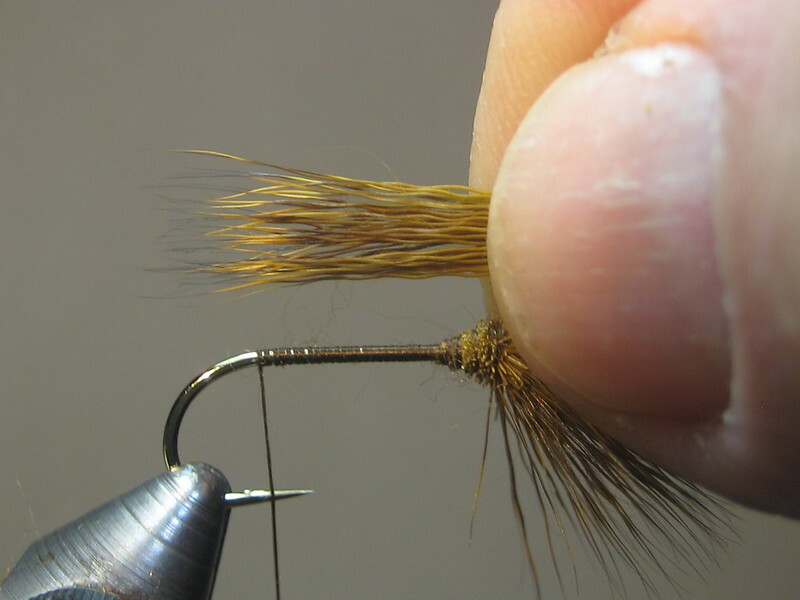 Too lazy to dye up some mearns quail for the shoulders (or at least some pliant guinea) so I went with craft store stock; red's a bit off from the body hackle (doubt that it will matter to the fish). 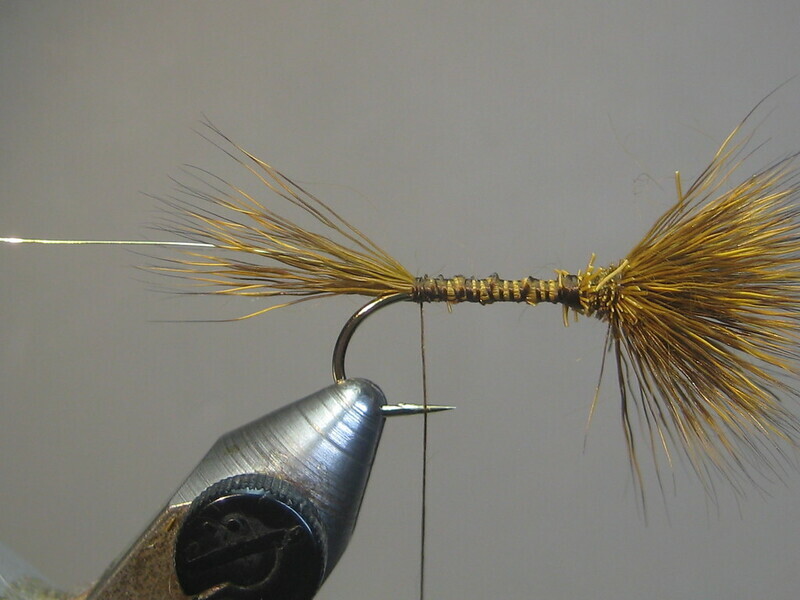 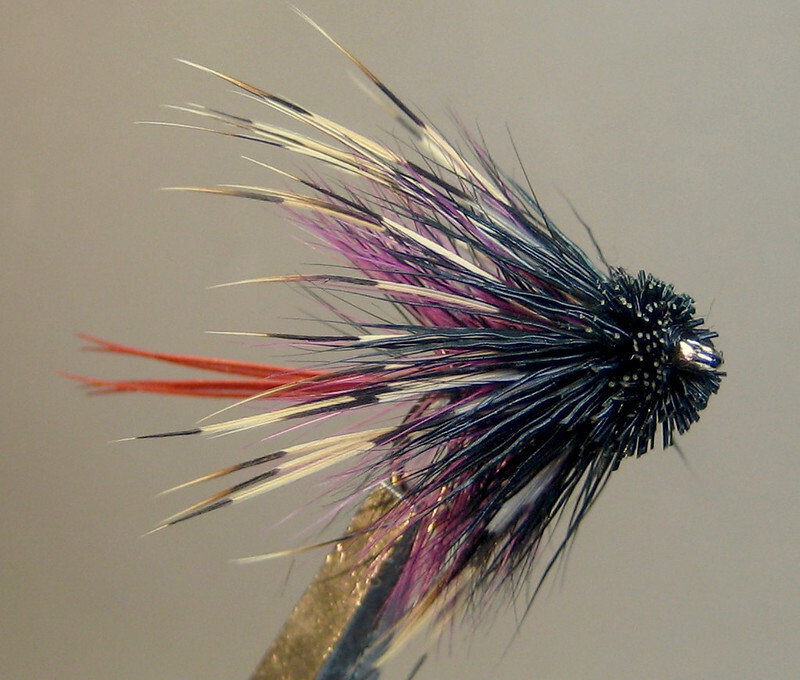 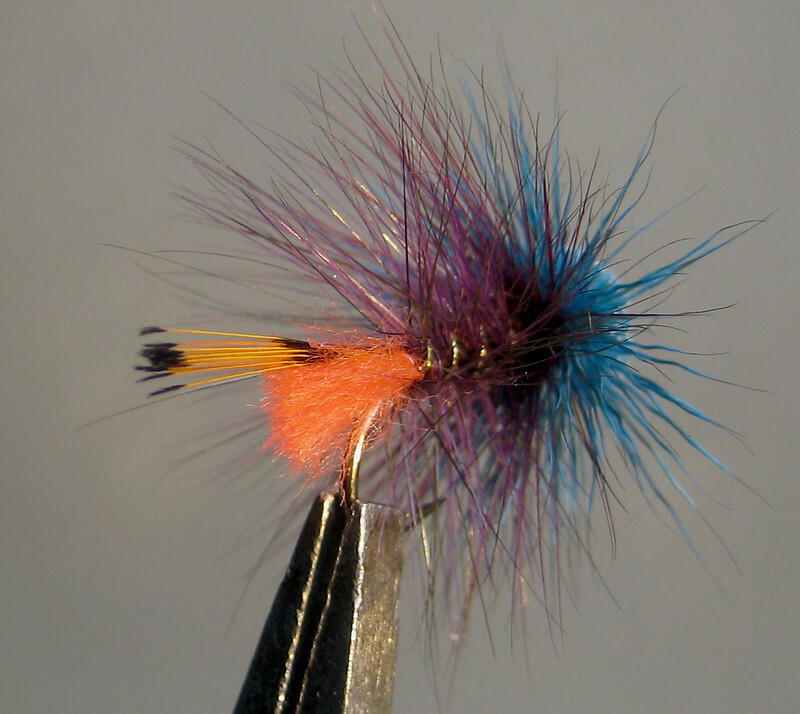 Need to find some decent black deer hair for Stan Headley's muddler version. 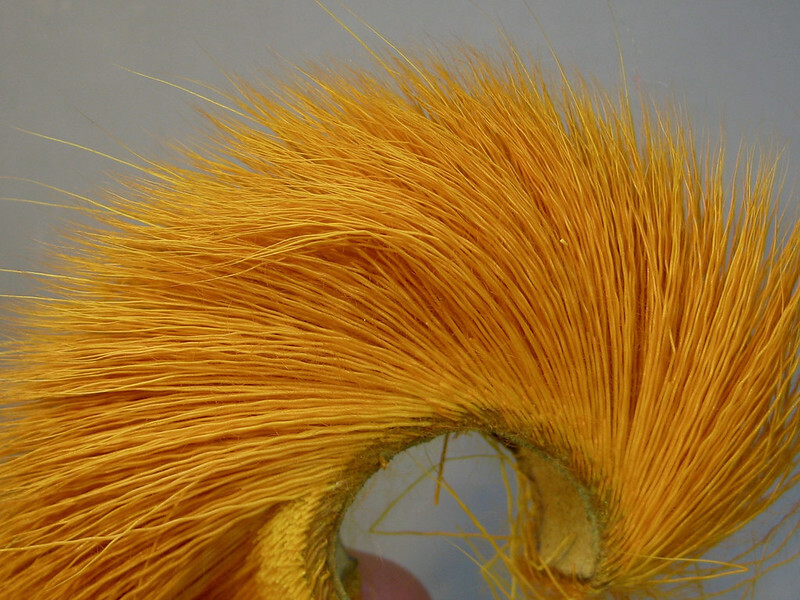 The hackle came out of the dye bath a bit more purple than I was looking for; weird, because I've had pretty good luck with that color. 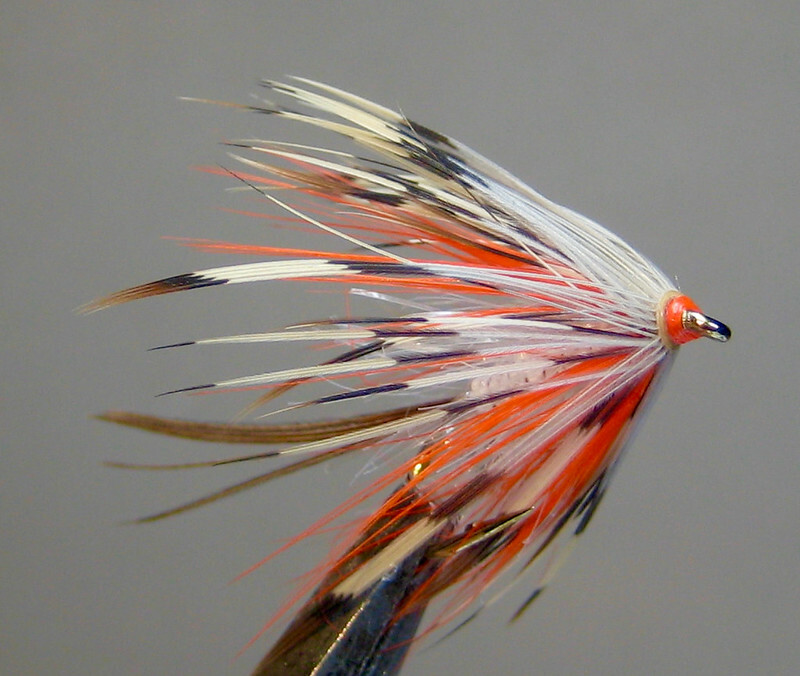 Cape was off-white so maybe that's why? 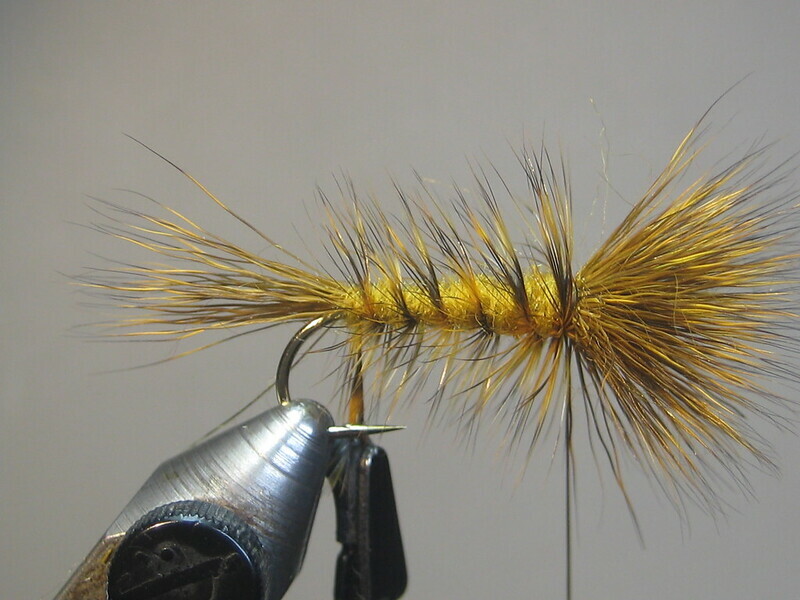 Playing around with a craft store find. 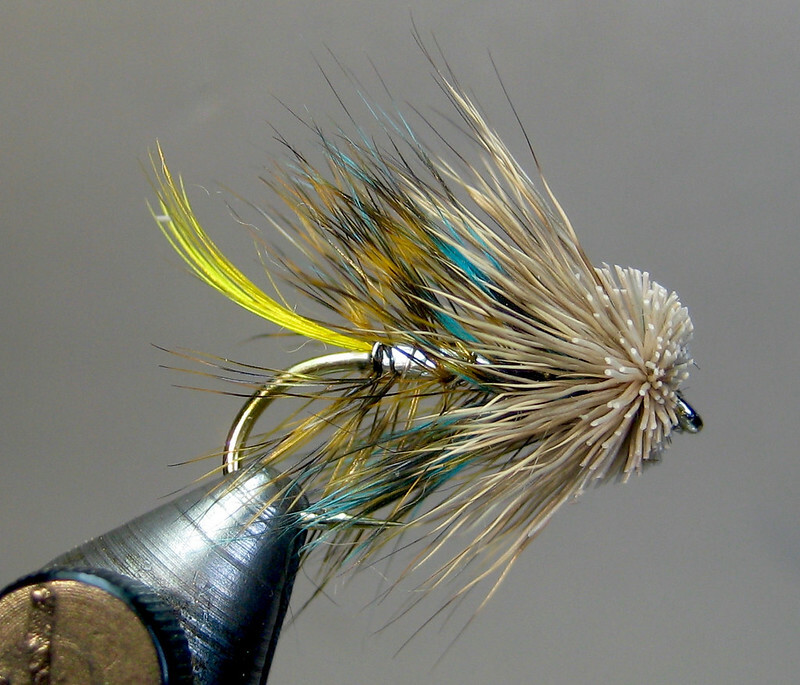 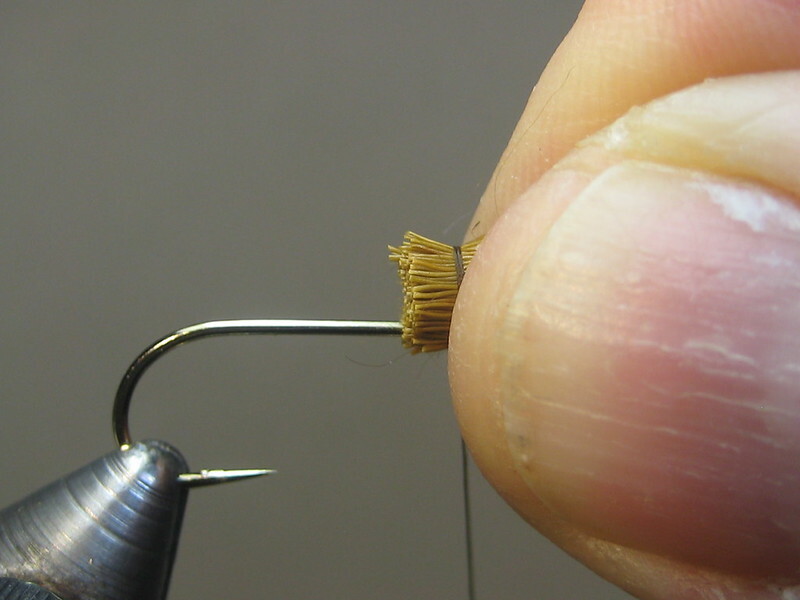 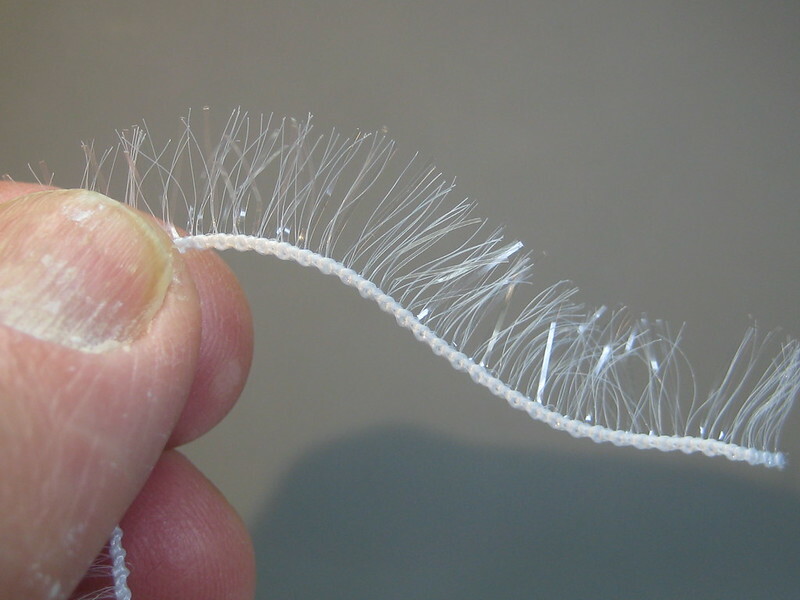 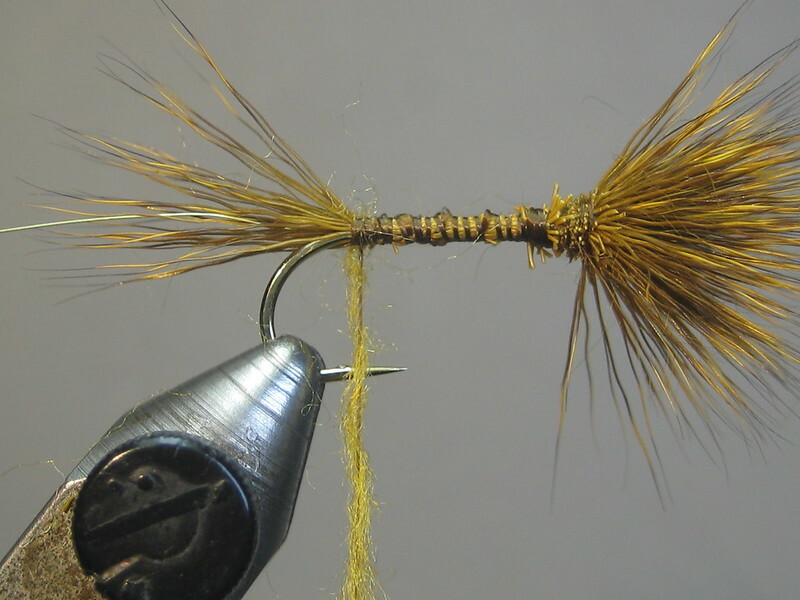 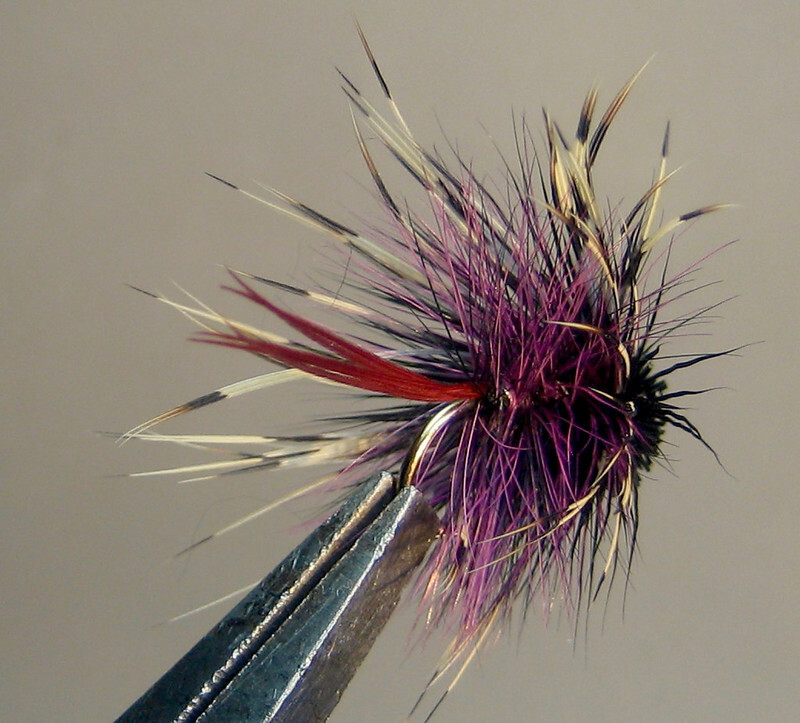 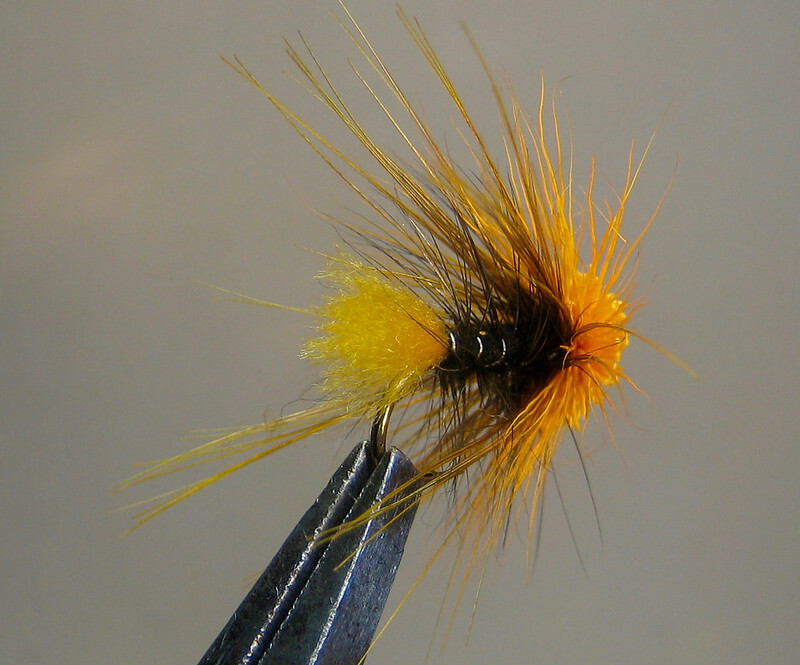 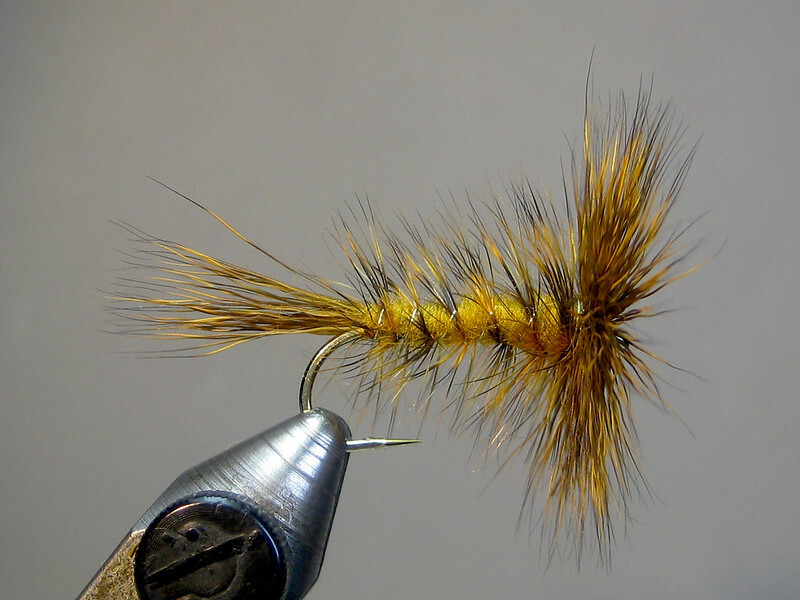 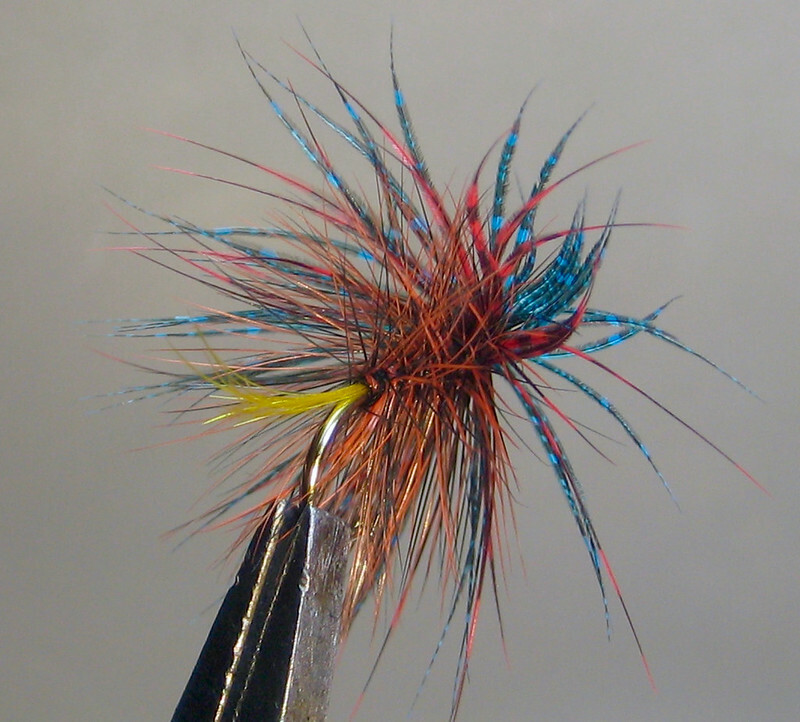 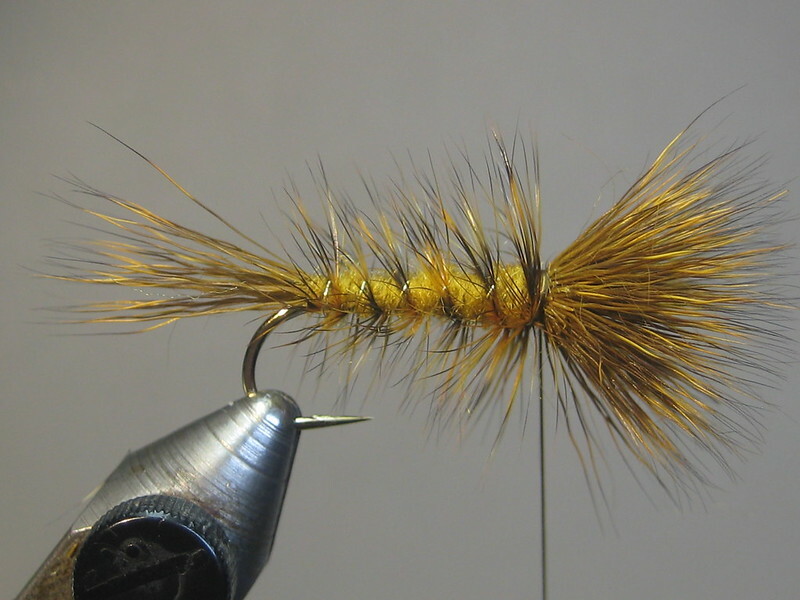 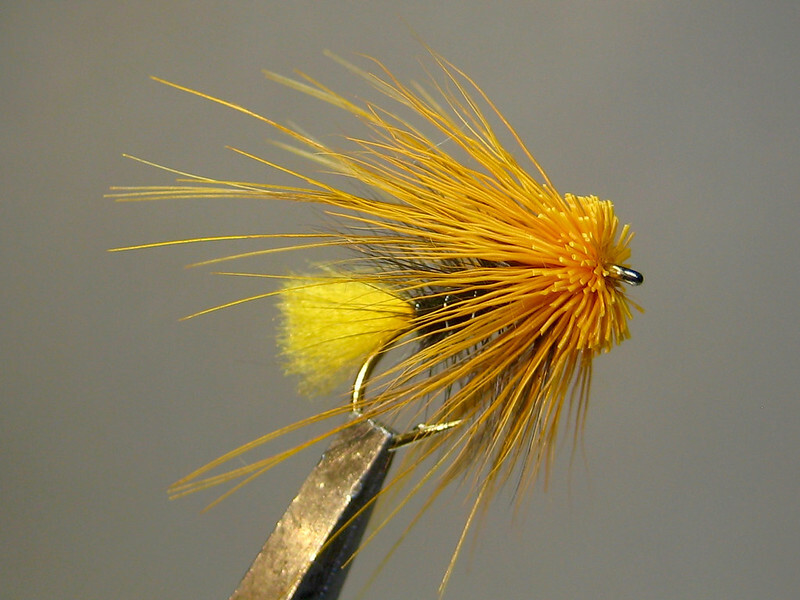 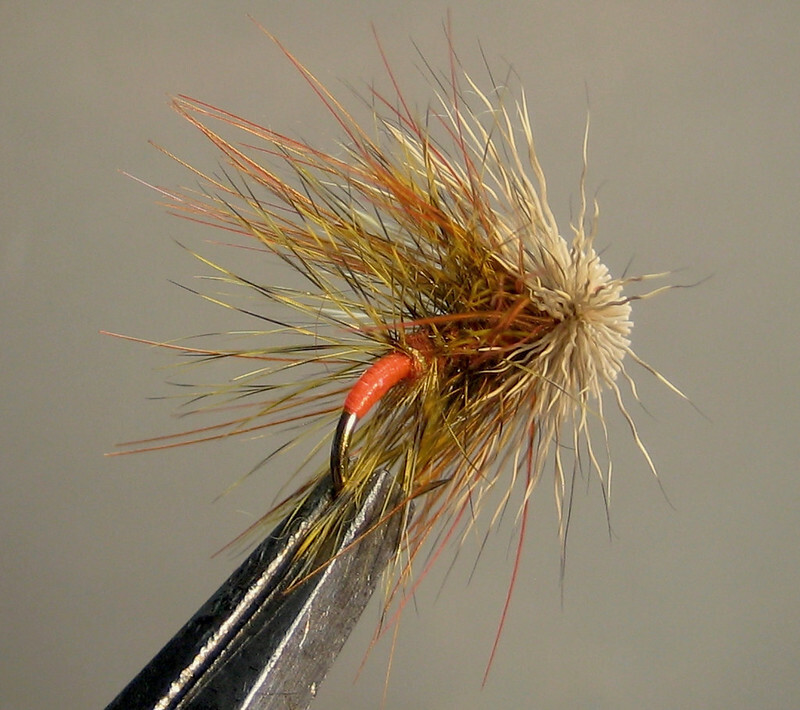 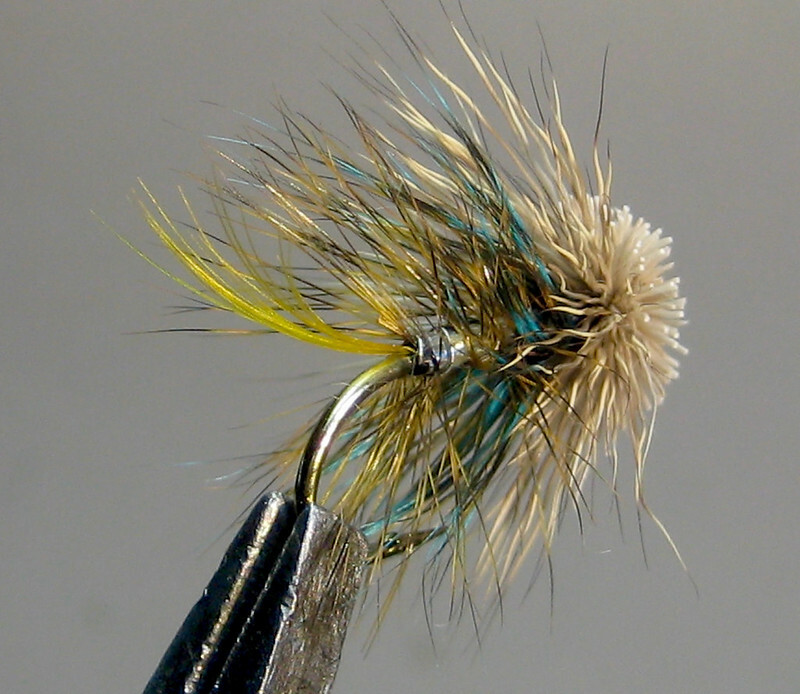 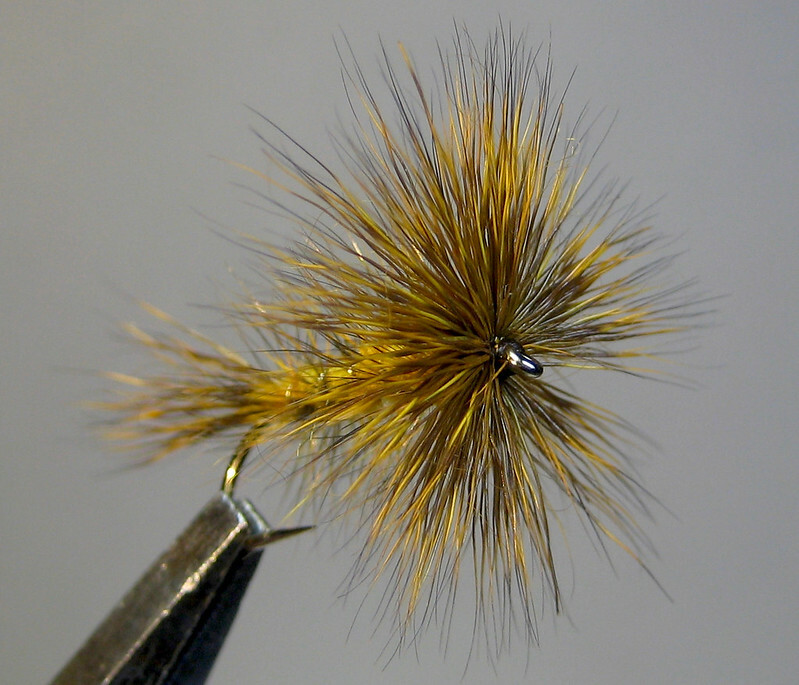 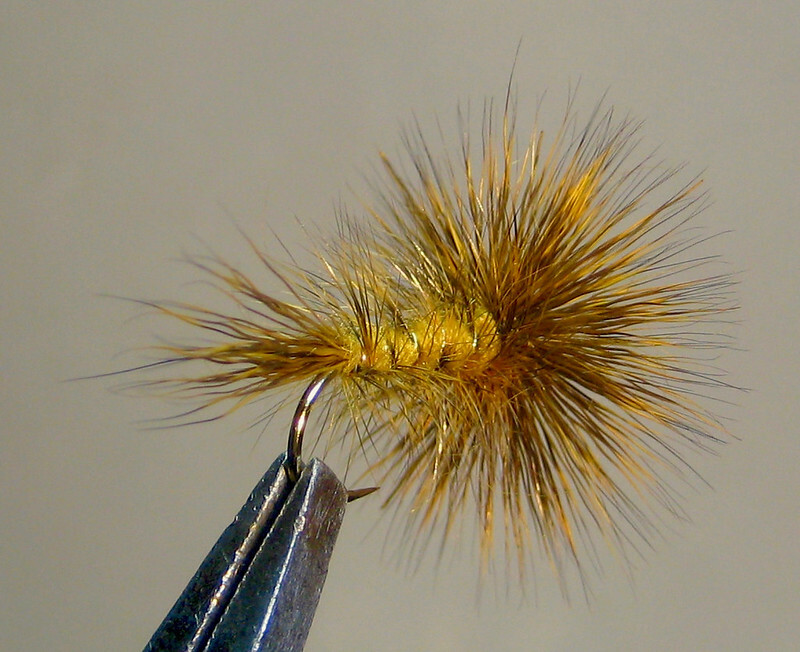 Not quite pseudo hackle or palmer chenille; comes in some interesting colors.